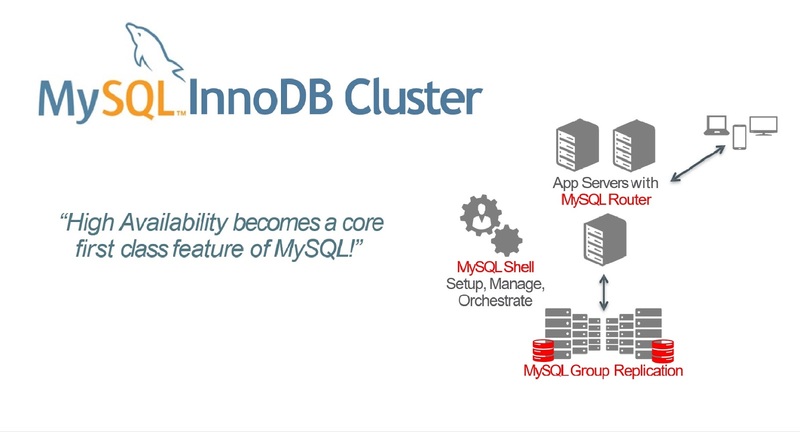 MySQL InnoDB cluster provides a complete high availability solution for MySQL.Each MySQL server instance runs MySQL Group Replication, which provides the mechanism to replicate data within InnoDB clusters, with built-in failover. In the default single-primary mode, an InnoDB cluster has a single read-write server instance – the primary. Multiple secondary server instances are replicas of the primary. If the primary fails, a secondary is automatically promoted to the role of primary. InnoDB Cluster uses the Group Replication plugin to allow for virtually synchronous replication, while also providing a MySQL Router that is aware of the cluster state. InnoDB Cluster also provides a new MySQL Shell to interact with the cluster commands. InnoDB cluster uses Group Replication and therefore your server instances must meet the same requirements. All the tables must have InnoDB storage engine. Primary Keys : Every table that is to be replicated by the group must have a defined primary key, or primary key equivalent where the equivalent is a non-null unique key. IPv4 Network : The group communication engine used by MySQL Group Replication only supports IPv4. Network Performance : Group Replication is designed to be deployed in a cluster environment where server instances are very close to each other, and is impacted by both network latency as well as network bandwidth. Slave Updates Logged : (Set –log-slave-updates). Servers need to log binary logs that are applied through the replication applier. Servers in the group need to log all transactions that they receive and apply from the group. This is required because recovery is conducted by relying on binary logs form participants in the group. Set Binary Log format to ROW : Set –binlog-format=row. Group Replication relies on row-based replication format to propagate changes consistently among the servers in the group. Global Transaction Identifiers On : (Set –gtid-mode=ON). Group Replication uses global transaction identifiers to track exactly which transactions have been committed on every server instance and thus be able to infer which servers have executed transactions that could conflict with already committed transactions elsewhere. Replication Information Repositories : (Set –master-info-repository=TABLE ) and –relay-log-info-repository=TABLE. The replication applier needs to have the master information and relay log metadata written to the mysql.slave_master_info and mysql.slave_relay_log_info system tables. Transaction Write Set Extraction : Set –transaction-write-set-extraction=XXHASH64 so that while collecting rows to log them to the binary log, the server collects the write set as well. The write set is based on the primary keys of each row and is a simplified and compact view of a tag that uniquely identifies the row that was changed. Multi-threaded Appliers : Group Replication members can be configured as multi-threaded appliers, enabling transactions to be applied in parallel. Set –slave-parallel-workers=N (where N is the number of parallel applier threads), –slave-preserve-commit-order=1, and –slave-parallel-type=LOGICAL_CLOCK. Setting –slave-parallel-workers=N enables the multi-threaded applier on the member. Group Replication relies on consistency mechanisms built around the guarantee that all participating members receive and apply committed transaction in the same order, so you must also set –slave-preserve-commit-order=1 to ensure that the final commit of parallel transactions is in the same order as the original transactions. Finally, in order to determine which transactions can be executed in parallel, the relay log must contain transaction parent information generated with –slave-parallel-type=LOGICAL_CLOCK. Install Python : The provisioning scripts that MySQL Shell uses to configure servers for use in InnoDB cluster require access to Python version 2.7. For a sandbox deployment Python is required on the single machine used for the deployment, production deployments require Python on each server instance. Configure each machine to map the IP of each other machine to a hostname. Configure the report_host variable in the MySQL configuration of each instance. The first step is to deploy sandbox MySQL Server instances, so that we can play around and experiment safely, without affecting any existing MySQL databases. The argument to deployLocalInstance() is the TCP port number where MySQL Server should listen for connections. By default, the sandbox is created in a directory named $HOME/mysql-sandboxes/<port>. You will be prompted to pick a MySQL root account password for that instance, this is the password that you will use to connect to that instance in the future. Note: use the same password for all your sandboxes in the same cluster. Repeat the above command two more times, using different port numbers each time. This will allow us to create an InnoDB cluster that is tolerant to up to one failure. The user account used to administer an instance does not have to be the root account, however the user needs to be assigned full read and write privileges on the InnoDB cluster metadata tables in addition to full MySQL administrator privileges (SUPER, GRANT OPTION, CREATE, DROP and so on). If only read operations are needed (such as for monitoring purposes), an account with more restricted privileges can be used. In addition to enabling the MySQL Shell log level, you can configure the amount of output Admin API provides in MySQL Shell after each call to the API. 2 adds debug output to the verbose output providing full information about what each call to Admin API executes. Before creating a production deployment from server instances you need to check that MySQL on each instance is correctly configured by using the dba.checkInstanceConfiguration() function. The restart_required field in the final part of the report tells you whether MySQL on the instance requires a restart to detect any change made to the configuration file. AdminAPI provides the dba.configureLocalInstance() function that finds the MySQL server’s option file and modifies it to ensure that the instance is correctly configured for InnoDB cluster. Alternatively make the changes to the instance’s option file manually based on the information in the report. Repeat this process for each server instance that you added to the cluster. Similarly if you modify the cluster structure, for example changing the number of instances, you need to repeat this process for each server instance to update the InnoDB cluster metadata accordingly for each instance in the cluster. Once you have prepared your instances, use the dba.createCluster() function to create the cluster. The machine which you are running MySQL Shell on is used as the seed instance for the cluster. The seed instance is replicated to the other instances which you add to the cluster, making them replicas of the seed instance. Log in to the instance and run MySQL Shell locally. To persist the InnoDB cluster metadata for all instances, log in to each instance that you added to the cluster and run MySQL Shell locally. MySQL Shell must be connected to an instance before you can create a cluster because when you issue dba.createCluster(name) MySQL Shell creates a MySQL protocol session to the server instance connected to the MySQL Shell’s current global session. If you encounter an error related to metadata being inaccessible you might have the loop-back network interface configured. For correct InnoDB cluster usage disable the loop-back interface. To check the cluster has been created, use the cluster instance’s status() function. Once server instances belong to a cluster it is important to only administer them using MySQL Shell and AdminAPI. Attempting to manually change the configuration of Group Replication on an instance once it has been added to a cluster is not supported. Similarly, modifying server variables critical to InnoDB cluster, such as server_uuid after an instance is configured using AdminAPI is not supported. We can now validate that the dataset on the other instances is correct (no extra transactions executed). This is done by validating the GTIDs. The instance 'prodserver11:3306' is valid for the cluster. The instance is new to Group Replication. The instance 'prodserver22:3306' is valid for the cluster. Use the cluster.addInstance(instance) function to add more instances to the cluster, where instance is a URI type string to connect to the local instance. To verify the instance has been added, use the cluster instance’s status() function. Note : If you have SELinux enabled this step may fail, because you may need to run additional commands to add a policy and enabled this. This command queries the current status of the InnoDB cluster and produces a short report. The status field for each instance should show either ONLINE or RECOVERING. RECOVERING means that the instance is receiving updates from the seed instance and should eventually switch to ONLINE. Another point to note is that one of the instances (the PRIMARY) is marked R/W (read/writable), while the other two are marked R/O (read only). Only the instance marked R/W can execute transactions that update the database. If that instance becomes unreachable for any reason (like a system crash), one of the remaining two instances automatically takes over its place and becomes the new PRIMARY. ONLINE: The instance is online and participating in the cluster. OFFLINE: The instance has lost connection to the other instances. RECOVERING: The instance is attempting to synchronize with the cluster by retrieving transactions it needs before it can become an ONLINE member. UNREACHABLE: The instance has lost communication with the cluster. ERROR: The instance has encountered an error during the recovery phase or while applying a transaction. MISSING : The state of an instance which is part of the configured cluster, but is currently unavailable. If you have an existing deployment of Group Replication and you want to use it to create a cluster, pass the adoptFromGR option to the dba.createCluster() function. Group Replication members might contain MyISAM tables. Convert all such tables to InnoDB before adopting the group to an InnoDB cluster. In order for applications to handle failover, they need to be aware of the topology of the InnoDB cluster. They also need to know, at any time, which of the instances is the PRIMARY. While it’s possible for applications to implement that logic by themselves, MySQL Router can do that for you, with minimal work and no code changes in applications. MySQL router provides you the ability to hide your network configuration behind a proxy and map the data requests to the cluster. MySQL Router can configure itself based on the InnoDB cluster’s metadata using the –bootstrap option. This configures MySQL Router automatically to route connections to the cluster’s server instances. Client applications connect to the ports MySQL Router provides, without any need to be aware of the InnoDB cluster topology. The recommended deployment of MySQL Router is on the same host as the application.You need the MASTER key of the InnoDB cluster to auto-configure MySQL Router. MySQL Router uses the included metadata cache plugin to retrieve the InnoDB cluster’s metadata, consisting of a list of server instance addresses which make up the InnoDB cluster and their role in the cluster. MySQL Router  has now been configured for the InnoDB cluster 'prodcluster'. 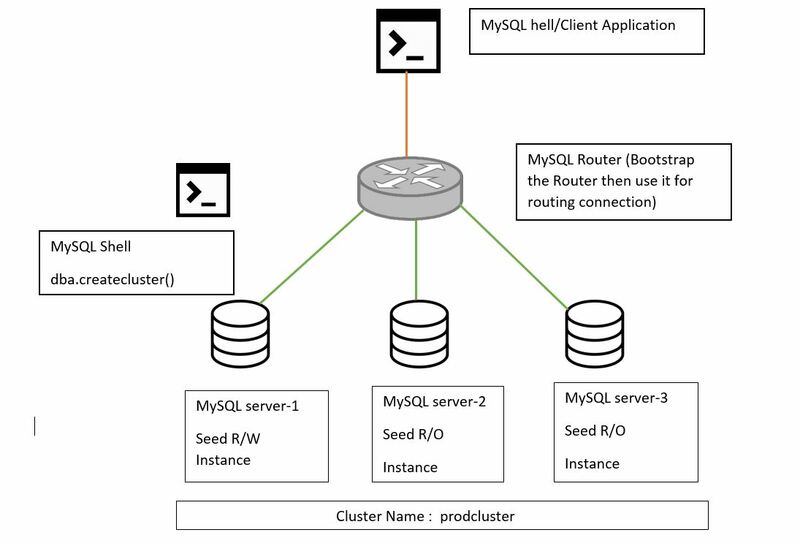 MySQL Router connects to the InnoDB cluster, fetches its metadata and configures itself for use. The generated configuration creates 2 TCP ports: one for read-write sessions (which redirect connections to the PRIMARY) and one for read-only sessions (which redirect connections to one of the SECONDARY instances, in a round-robin fashion). The MySQL Router bootstrap process creates a mysqlrouter.conf file, with the settings based on the cluster metadata retrieved from the address passed to the –bootstrap option. Based on the InnoDB cluster metadata retrieved, MySQL Router automatically creates a configuration file, including a metadata_cache section with bootstrap_server_addresses containing the addresses for all server instances in the cluster. When you change the topology of a cluster by adding another server instance after you have bootstrapped MySQL Router, you need to update bootstrap_server_addresses based on the updated metadata. Either restart MySQL Router using the –bootstrap option, or manually edit the bootstrap_server_addresses section of the mysqlrouter.conf file and restart MySQL Router. The generated MySQL Router configuration creates TCP ports which you use to connect to the cluster. Ports for communicating with the cluster using both Classic MySQL protocol and X Protocol are created. To use X Protocol the server instances must have X Plugin installed and configured. For a sandbox deployment, instances have X Plugin set up automatically. For a production deployment, if you want to use X Protocol you need to install and configure X Plugin on each instance, see Section 19.3, “Setting Up MySQL as a Document Store”. 6446 For Classic MySQL protocol read-write sessions, which MySQL Router redirects incoming connections to primary server instances. 6447 For Classic MySQL protocol read-only sessions, which MySQL Router redirects incoming connections to one of the secondary server instances. 64460 For X Protocol read-write sessions, which MySQL Router redirects incoming connections to primary server instances. 64470 For X Protocol read-only sessions, which MySQL Router redirects incoming connections to one of the secondary server instances. When using a single-primary cluster, read-write sessions are redirected to the single primary, with a multi-primary cluster read-write sessions are redirected to one of the primary instances. For incoming read-only connections MySQL Router redirects connections to one of the secondary instances in a round-robin fashion. You can now connect a MySQL client, such as MySQL Shell to one of the incoming MySQL Router ports as described above and see how the client gets transparently connected to one of the InnoDB cluster instances. To test if high availability works, simulate an unexpected halt by killing an instance. The cluster detects the fact that the instance left the cluster and reconfigures itself. Exactly how the cluster reconfigures itself depends on whether you are using a single-primary or multi-primary cluster, and the role the instance serves within the cluster. If the current primary leaves the cluster, one of the secondary instances is elected as the new primary, with instances prioritized by the lowest server_uuid. MySQL Router redirects read-write connections to the newly elected primary. If a current secondary leaves the cluster, MySQL Router stops redirecting read-only connections to the instance. There are various ways to simulate an instance leaving a cluster, for example you can forcibly stop the MySQL server on an instance, or use the AdminAPI dba.killSandboxInstance() if testing a sandbox deployment. Feb 16 16:48:35 prodserver55 systemd: Started MySQL Server. Feb 16 17:08:54 prodserver55 systemd: Stopped MySQL Server. The global session got disconnected. Attempting to reconnect to 'innob_user@prodserver55:6446'..
How To Rejoin A Node To The Cluster? If an instance leaves the cluster, for example because it lost connection and did not or could not automatically rejoin the cluster, it might be necessary to rejoin it to the cluster at a later stage. To rejoin an instance to a cluster issue cluster.rejoinInstance(). Then connect to the instance, run MySQL Shell locally and issue dba.configureLocalInstance(). This ensures the InnoDB cluster configuration is persisted to the instance’s option file to enable it to rejoin the cluster automatically. If your cluster suffers from a complete outage, you can ensure it is reconfigured correctly using dba.rebootClusterFromCompleteOutage(). In the event that a cluster has completely stopped, the instances must be started and only then can the cluster be started. If changes to an instance’s configuration are made without using AdminAPI, you need to rescan the cluster to update the InnoDB cluster metadata. Rescan the cluster with cluster.rescan() to update the InnoDB cluster metadata. The cluster.checkInstanceState() function can be used to to verify the existing data on an instance does not prevent it from joining a cluster. The instance 'prodserver55:3406' is valid for the cluster. OK new: the instance has not executed any GTID transactions, therefore it cannot conflict with the GTIDs executed by the cluster. OK recoverable: the instance has executed GTIDs which do not conflict with the executed GTIDs of the cluster seed instances. ERROR diverged: the instance has executed GTIDs which diverge with the executed GTIDs of the cluster seed instances. ERROR lost_transactions: the instance has more executed GTIDs than the executed GTIDs of the cluster seed instances. To dissolve an InnoDB cluster you connect to a read-write instance, for example the primary in a single-primary cluster, and use the Cluster.dissolve() command. When using MySQL Group Replication, it’s possible that some members are lagging behind the group. Due to load, hardware limitation, etc… This lag can become problematic to keep good certification behavior regarding performance and keep the possible certification failure as low as possible. When group_replication_flow_control_mode is set to QUOTA on the node seeing that one of the other members of the cluster is lagging behind (threshold reached), it will throttle the write operations to the the minimum quota. This quota is calculated based on the number of transactions applied in the last second, and then it is reduced below that by subtracting the “over the quota” messages from the last period. When the incident is too long and flow controls starts to kick in, all the cluster will start slowing down… if this is an incident expected to be long to solve or a maintenance, the first thing we would like to do is to stop sending MySQL traffic to the node (reads and/or writes in case of Multi-Primary cluster). Then we want that the specific node stops sending its statistics to the other nodes. Now that this node won’t trigger any flow control anymore, the cluster will run as its optimal speed and this provides you extra time to fix the problem or finish the maintenance. As soon as the maintenance is finished and the queue recovered, you can set it back to ‘QUOTA’. I love your blogs.Nice efforts superman..! !